Whenever someone new starts playing BW, first thing that's mentioned to them is that they should be prepared to lose a decent amount of games on ICCup, usually in the vicinity of 50 games or so until they can at least hold their own and maybe win a game. My own record when I first started playing on ICCup was a dismal 20-84 or about 19% win rate stretched over several seasons. Think about it. 19%! ya, I got stomped hard lol. Also, some of those wins were opponents disconnecting or in a game or two, they just decided to leave after I gg'd (pity points? lol). In SCII, cheese has a bad ring to it since it's not as accepted due to being hard to defend even when scouted (1/1/1 etc...) and where you'll be cursed if you cheese lol. On ICCup, anything goes. People aren't caught up with how to play 'right' if you can call it that. Their main goal is to win the game and that's all they care about. Things like proxy 10/15 gate into dt followup or 9 pool speedling all in are things that I've seen on a decent enough basis(being casual and all), more so if you're peruvian or from SA it seems. This makes ICCup really competitive because there is no limit or boundaries to stick to and makes for some crazy, bizzare yet fun games. This also reminds of an SCII game that I played on the KR server back when Blizzard first patched in cross-servers and such. TvP on some map, my opponent went for speed zealots(chargelots in SCII terms) and managed to contain me to 1 base. Eventually I break out, re-establish my expansion and hurt his eco with a drop or something. His response? a 2 base 2 colossi(or was it 1? )+workers all in. It was such a quick decision. You can tell it wasn't planned but the goal wasn't to play 'right' but to win. I remember being taken back because despite playing enough vP games(P seemed highly represented on NA plat servers at the time), I've never seen such a desperate move and it almost worked. ICCup experiences have been pretty similar and wacky which I like lol. As an example, an opponent went mass hydras against my MnM, almost broke through and then made 6-7 lurkers and tried to bust me. I mostly spend my time playing TvZ on ICCup whenever I get the chance. There is the occasional PvZ since I like the bisu build but haven't played any recently. When I first started playing as terran, I had issues walling which meant that if my opponent went 9 pool and kept pumping zerglings or even 2 gate, chances are I'll lose. I actually wrote a battlereport blog on here where I went for one of my signature walls lol. After losing 3-4 games in a row to pure zerglings, eventually I started parking an SCV or two on the ramp for blocking and sacrificed a bit of eco for a longer game. I was able to move away from that as my game sense increased and when I started to scout more carefully and read the signs. I guess better micro (a-moving workers was hard to break lol) also helped. 1 rax FE (cc inbase) started to become my go to build. Depending on the size map (think La Mancha and Circuit Breaker) and position of my opponent, I've even went 1 rax, delayed the first marine and built a cc on the low ground. I felt that I can hold any attacks especially if I scouted my opponent's 12 hatchery 11 pool cross position. It's been interesting to see the progression of my games and that of my opponents. Even though I've become better at holding off early game shenanigans and my micro has improved(MMF vs. zerglings+lurker) or holding off zergling+lurker all-ins, my mid to late game needs some work. I feel that on maps such as FS, it's pretty difficult to take a third and defend it. I've had no issues taking third on La Mancha and Circuit Breaker which are two big maps and even hold them whenever I'm attacked but on smaller map, it's much harder. I also wonder if it has to do with the map architecture but you can block your ramp with a rax+depot for a third on FS. I guess I just gotta take more risks then even if it means lifting my cc in moments of trouble. Most zergs I've encountered seem to prefer 12 hatch 11 pool and mutalisks. I guess it makes sense to try and keep the terran in his base while taking a third but enough turrets and good MnM micro seems to be a good enough counter. I have found that some D and higher opponents have decent muta micro which was surprising to me. I guess it's to be expected. Firebats are pretty helpful as well due to their insane dps against zerglings especially if the opponent goes for a zergling attack prior to mutalisks and I've started to add 1-2 early game. Once games tend to go to the late game, I find that my macro becomes ridiculously bad. I think my multitasking gets stretched thin and the thought of losing my army outweighs the thought of looking away to make more. In a way, it's always amazing to see pros look away from their army even during a battle and make another round of units. Either they are that confident in their ability to micro out of bad situations(think SK Terran against lurker contain) or they realize the value of more units at the expense of losing some if they are attacked. I think their speed is also a major factor. Seems like most pros(think Bisu for 10-12 structures) can make units from 8+ structure within a second or two at best compared to lower levels where'll it'll take several seconds for similar or less structures. Same with changing rally points and re-fixing control groups which is a welcome pain. APM wise, back when I first started SCII, I was averaging 80 with zerg which is pretty low but seemed good at the time. Transitioning to terran in both SCII(back then) and BW, I've managed to improve my APM to about 100. Nowadays or at least recent games, my APM is averaging about 130 with peaks of 310 which sounds insane. Wonder what I was doing at that time, probably just making workers and units or something lol. ps I still can't wall to save my life lol. pps to clarify, I don't think vessels are imbalanced by themselves but mass vessels(thinking 7+) are ridiculous in terms of irridate potential. Great blog. Congrats on the 8-0 winning streak, I have no doubt in my mind that soon you will be a solid D+ player. Also, kudos on playing Terran! 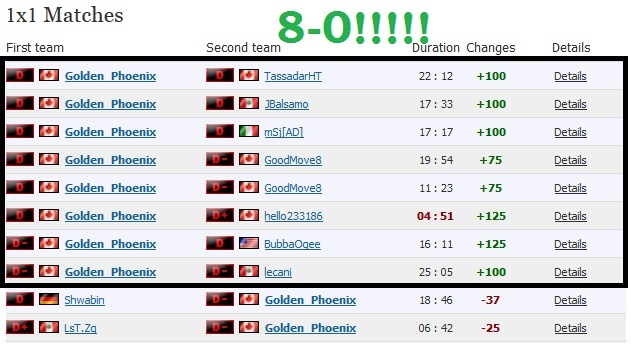 8-0 winning streak on Iccup is a tremendous accomplishment imo. TvZ in BW is truly a joy. Well done man! The last couple seasons I've averaged 1500 D, but this season I've tanked to the 600's for some reason (that's with one favourable disconnect) and some B- player popping in my game wondering if my IQ is 90 or 70, lol. One of these games this season I'll get a legit win... maybe. Great that you're taking losing in a positive light and actively looking to improve! ya it is but still feels a bit odd. Part of me prefers that my opponents were higher ranked but considering I was probably around the skill level, 8-0 is pretty decent lol. thanks Falling! ouch, that's quite the drop. I actually went on a 8+ losing streak before this win streak and was something like 700(or 800?) D- player so I know the feeling. You make bad mistakes, lose to dts as your ebay is building, etc... BW is a very unforgiving game in that context but winning also feels great. haha at the B- comment. Worst I got called was a noob way back after I just turtled in a TvZ and turret whore XD Don't worry, I'm sure you'll get a legit win any day now Feel free to join my 1v1 adventures whenever you like. Maybe a bo5 series on maps like FS, circuit breaker, La Machua, Luna and whatever fifth map is. Ya, it definitely feels good but I'm sure I'm bound to lose a game soon lol. I dream of one day becoming the next flash! lol. Seriously though, I agree. Positivity is important but it's quite difficult if you end up on the end of a losing streak as well ><; thanks! a long and tough but fun one so it's exciting ^^ thanks! I bet all your losses were against protoss! Good luck mang! Grats on the streak! I know you don't want my advice, so I spoiler'd it. I just couldn't resist writing it. Mad props for getting into iCCup. I know that it's tough to start winning games, and it takes a real competitive drive to get in there and take 8 in a row! Two/three base muta has been standard ZvT for a while. This harasses the Terran and lets you get up your third basee. The immediate followup is lurkers. They help keep MnM from killing your new third gas, but generally get pushed back by tanks and vessels. Which brings us to the defiler. So in short, you have 3 big timings. Before mutas, Before lurkers are in force, and (biggest one) before defilers. FINALLY broke my loss streak. If you count non-ladder games, it was 19 losses in a row before I finally beat someone. D+ of all things. Maybe I can get some sort of win streak, but I doubt it. dang that scumbag race Actually, most were from Zerg lol. thanks! your advice is pretty much what I see with most Zergs, mutas into third into more bases/late game with defilers. If I'm able to do some damage early on and limit them to a third then I may have a chance at winning. ya, I mostly thought that lurkers while won't keep the opponent in his base at high level, might be more useful at lower levels due to lower micro and mechanics and wondered why they don't get used much considering they can be a free win at times lol. thanks! I would be worried that I would actually win against you hehe.